Joe Skladany was one of the best football play-iars to come out of the coal regions. Skladany :started his career by winning all-scholastic hon-I ors at Larksville High School in 1928 and 1929. He went on to play at the University of Pitts-burgh under Coach Jock Sutherland. Pittsburgh sports writers called Skladany the “Baby-Faced Assassin” as he helped Pitt to Eastern championships in 1931 and 1932 and helped the Panthers earn a Rose Bowl berth against USC. Skladany was an All-American in 1932 and:1933. In 1933, he was also named to the Liberty Magazine All-Players All-American team. Over 1,500 players from 91 colleges voted for the team. In 1934 he played professional football and scouted for Washing-ton and Pittsburgh. He later served as an assistant football coach at Pittsburgh, Carnegie Tech and the U.S. Naval Academy. 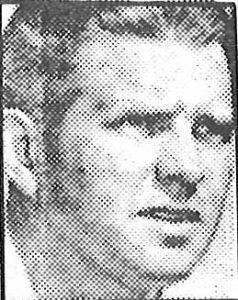 In 1968, Skladany was named by the Pittsburgh Press to the all-time Pitt team from 1910-1968. Skladany died Aug. 9, 1972.